WHEE!! But seriously, that’s a rather expensive surprise gift. It was Miss Jenn, the lovely lady who I’ve been working with to alter and personalize her Sisterhood of the Traveling Dress wedding gown! She and her bridesmaid, Monica, had arranged to send me the mixer as payment and thank you for the work I was doing on their dresses. So we unpack it, and realize … OOPS … our kitchen stuff really doesn’t match. But crap, this is the color that was especially picked out for us (i.e. it wasn’t the standard red). Hmmm … what to do? Well, Jenn settled that. While stopping by for her final fitting she saw it on the counter and said “Huh, that’s not the color I thought it was going to be.” She proceeded to fill me in on the sneakiness she and Rachel had been doing, trying to figure out which color we wanted, and told me to return it for the color we liked best. Meet … well, she doesn’t have a name yet. Lauren says she looks like “a lady who lunches”. Anyone have name suggestions? 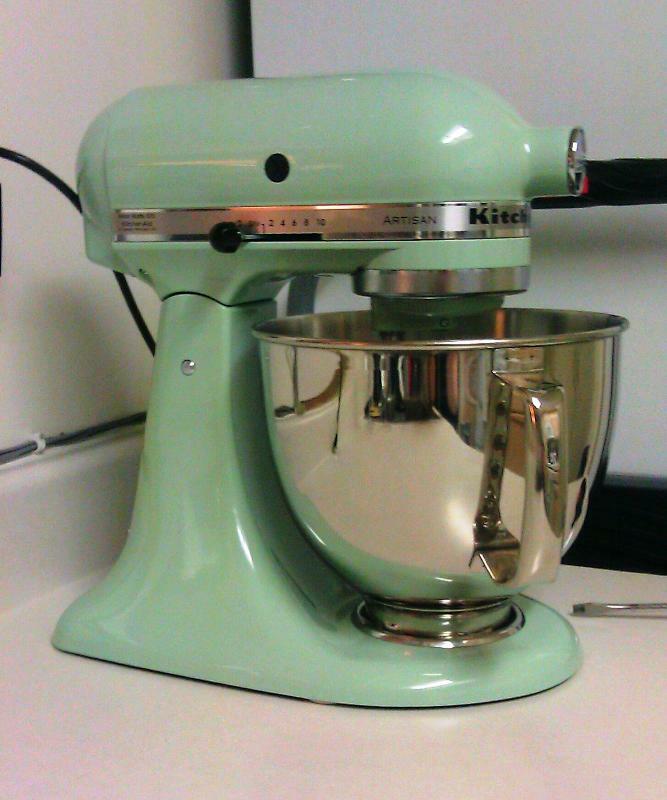 And I tell you right now, my mixer will NOT be named Muffy. Yick. Isn’t she pretty? I may or may not have spent the better part of last night with my cheek pressed against the top, hugging her. What? Don’t look at me like that! You’d do it, too! So yes … a name is needed. And a suggestion for an inaugural use. After all, the weekend is here, and the great wide world of baking is mine to conquer! * Or something along those lines. Sorry, Jenn, I can’t remember exactly! *** The color is Pistachio, for those interested. The husband keeps saying it looks vintage-y … which is the same thought I had when I first was looking at the different colors. $10 says it’s the same color as my mom’s. It goes perfectly in our kitchen. I LOVE IT. That color is fab! It makes me think of Jersey diners, which is a nice warm feeling. yayyyy I’m glad now its the right colour 🙂 enjoy it! and bake me cupcakes 🙂 after I wear the dress of course. Actually, this one came without a packing slip as well. It’s either falling out of the box (there were holes cut so they could scan the barcode) or they just don’t include them in the already-packaged items. Which is stupid. If you can’t include a packing slip, don’t offer to put a gift message! My husband bought me one for Christmas a few years ago. It was red which matches my kitchen (and was no short miracle since he is color blind). 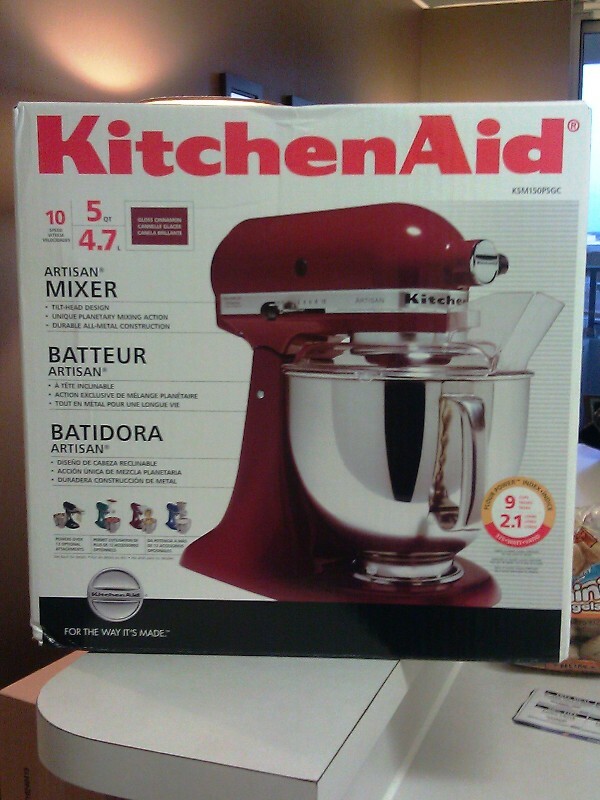 I squeed and forgot to open the rest of my presents as I was too busy unpacking and plugging in my new mixer. My husband swears I am the only woman in the world who gets kitchen appliances and carpet cleaners as gifts and is not pissed off about it. I told him he was daft as I couldn’t think of one of my girlfriends who would not be thrilled at a mixer like that. I made him molasses cookies (Ok I made them for both of us since they are both of our favorite cookie) to celebrate the mixer. I love the pistachio though. It does have that vintage feel to it. Ladies that lunch makes me think of names like Sandra, and Tatum, Elise. Not sure if those are good names for mixers or not, but its the best I have. My naming convention for inanimate objects is typically to name it the first name that comes out of my mouth when I speak to it. Unless it is a plant and then it is named George (as in George Harrison). There was a second box to be opened when I got home, and I made sure to do that one FIRST, so that I wouldn’t forget about it in the mixer-happiness. Because I totally would have. That is actually the way I normally name things. It happened that way with my dress form. But Lauren pulled out “ladies who lunch” before I’d actually SPOKEN, so then all I could think of was Muffy. And that is NOT happening. Also … George. I love it. Yes, that color is SO retro – love it! I have a dark blue but now wish I had it in red to match our kitchen. I am ALWAYS game for good cake recipes. And now that it won’t cause me to lose an arm, I’m up for trying all kinds of new ones. Yay Jenn! And mixers! That is an excellent color. I like Holly. And also Alice, because it makes me think of a diner lady. ::laughs:: Yep, that’d be her! She also did the fabulous homemade letterpress post because she’s FANCY. And oooh, I like Alice. Hmm … things to think about. Omg, the letterpress. That was bananas. Jenn rules. That color is beautiful, I love green aqua green, turqoise green, light green. It does look vintagey. Enjoy the baking ! OOOH she is gorgeous. And Alice is a perfect name for her.